Whenever new stickers from Cloud 9 Designs stickers arrive in store, I always get excited. My poor husband has to watch me going through them all saying, “I’ll have one of these…and one of these…oh, and I HAVE to have one of these!” Lol. So this week, I thought I should stop drooling all over them and actually use some. And here is the result! This layout was created using dark brown Bazzill cardstock, KI Peach Blossoms paper, Autumn Leaves Linen Stripes paper, Hot Off The Press Brown Swirls paper, cream cardstock, dark brown Co-ordinations cardstock, brown ink, a brown pen, Creative Imaginations Epoxy Leaves alphabet stickers, Making Memories Brown Alphabet stickers and Cloud 9 Travel Elements stickers. 1. Use the dark brown Bazzill cardstock as your background. 2. Cut a piece of KI Peach Blossoms paper measuring approximately 28.5cm by 26cm. Tear away the bottom right corner so you have a diagonal line from the bottom left corner to about 19.5cm down the right side. Ink the edges with brown ink and when dry, use a brown pen to draw a dashed border around all the edges except the bottom edge. Glue to your page approximately 1cm from the left edge and 1cm from the top edge. 3. Cut a piece of Autumn Leaves Linen Stripes paper measuring approximately 14cm by 29cm. Again, tear along the bottom edge at an angle, as shown above. Ink the edges with brown ink and when dry, use a brown pen to draw a dashed border around all the edges except the bottom edge. Glue to your page approximately 1.8cm from the left edge and up against the top edge. 4. Mat your main photo (I have used a 5×7 photo cropped to 17.7cm by 11cm) with cream cardstock. Mat again with Hot Off The Press Brown Swirls paper. You should end up with a border of Brown Swirls paper approximately 1.2cm wide all the way around. Ink the edges with brown ink. When dry, tear a corner piece from dark brown Co-ordinations cardstock and glue in the bottom right corner of your photo mat, as shown above. Then glue your photo mat to your page approximately 4.5cm from the left edge and 4.2cm from the top edge. 5. 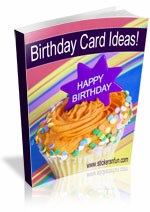 Mat your second photo with cream cardstock (I have used a 4×6 photo). Cut a piece of dark brown Co-ordinations cardstock measuring approximately 2.5cm by the height of your photo mat (in my case, 10.5cm). Tear down the left edge and glue to the right side of your photo, as shown above. Place a green Totally Tourist sticker from Cloud 9 Travel Elements stickers in the middle of this strip, as shown above. Glue your photo to your page approximately 2.7cm from the right edge and 1.6cm from the bottom edge. 6. Mat your green flower strip sticker with dark brown Co-ordinations cardstock. Glue vertically to your page approximately 2.4cm from the left edge and up against the top edge. Place a flower sticker at the base, as shown above. 8. Using your Creative Imaginations Epoxy Leaves alphabet stickers and your Making Memories Brown Alphabet stickers, write your title to the left of your second photo, as shown above. Make sure you leave plenty of room for your journaling. 9. Cut out a piece of cream cardstock measuring approximately 8.2cm by 4.2cm. Tear along the bottom edge at an angle, as shown above. Ink the edges with brown ink and when dry, use a brown pen to draw a dashed border around all the edges except the bottom edge. Glue to your page in the space left underneath your title, as shown above. 10. Place a large brown flower sticker in the top right corner of your page. If you wish, use a yellow circle sticker to create an alternative centre to your flower as I have. 11. Finish off by placing a blue flower sticker and a small yellow circle sticker in the bottom right corner of your page, as shown above. What do you think? 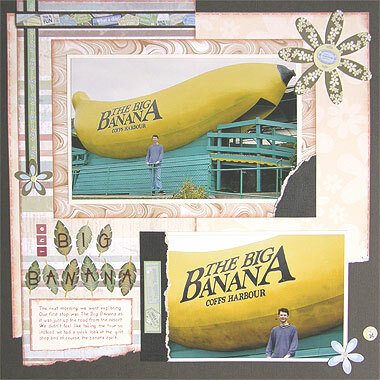 Do you like this Cloud 9 Designs scrapbooking idea? Do you have any questions? Would you have done anything different? We’d love to hear from you! Please leave a comment below. This entry was posted on Wednesday, October 29th, 2008 at 8:58 pm	and is filed under Paper Tearing, Scrapbooking Stickers, Vacation. You can follow any responses to this entry through the RSS 2.0 feed. You can leave a response, or trackback from your own site.